Plastic Logic has announced its QUE proReader. Plastic Logic has announced its QUE proReader – billing it as more than an eReader and pitching it as 'mobile professionals'. 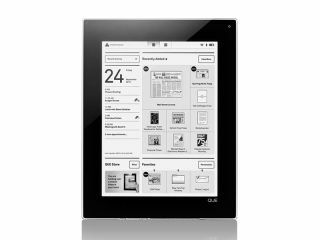 The 8.5×11 inch, 1/3 inch thick device offers what Plastic Logi is describing as a premium business reading experience. "Today we are introducing two major advancements: the birth of a new market category, the proReader, and a milestone in the evolution of plastic electronics," said Richard Archuleta, CEO of Plastic Logic. "The QUE proReader was built from the ground up for people who need to read. Starting today, mobile professionals can look forward to a paperless briefcase, a lighter load, and a better way to work." The inspiration for the QUE proReader was apparently the humble piece of paper, and it is the size of a typical pad. "Designed for more than good looks, QUE provides instant access to the content busy professionals need at their fingertips all day long – all their content anywhere any time: Read a newspaper over morning coffee. Review your appointments imported from Outlook. Have every document you need when you need it. And at the end of the day, relax with a good book, says Plastioc Logic's release. "In addition to highly valued business and professional newspapers, periodicals and eBooks, QUE supports reading and annotating document formats business users need (including PDF files, Microsoft Office, ePub documents and more).
" With the QUE software, it's easy to quickly transfer content from your PC, Mac® computer or BlackBerry smartphone to your QUE. The standard 4GB QUE model can hold up to 35,000 documents or the equivalent of up to 35 filing cabinets worth of documents." We haven't found out if there is a UK release or how much it will cost, but the US price for QUE will range from $649.00 for the 4GB QUE model $799.00 for the 8GB QUE model; so it's far from cheap.